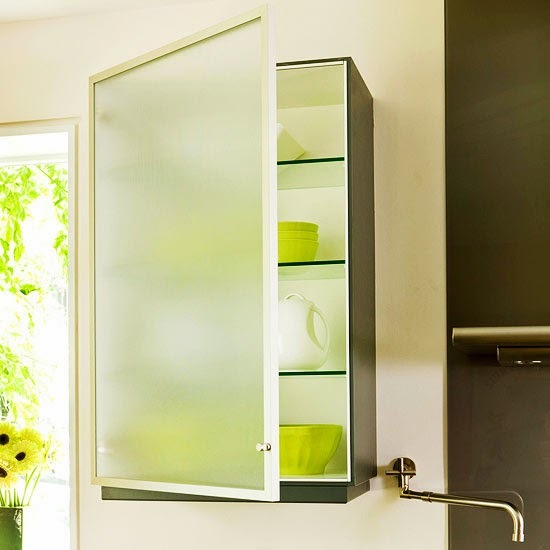 If you want to give your kitchen cabinets a bit of make over, you could try to change the wooden doors to glass. Some home makers though do not like the idea of showing the content of their cabinets. If this is the case, you may consider going for opaque doors. It actually looks light and clean! I guess, I have installed the same material in my bathroom which serves as our shower enclosure. It's tinted though so you cannot really see the person taking a shower but I love that it looks neat and elegant. I guess the same kind of materials can be great for kitchen cabinet doors, as well but I think it would be nicer to choose a frosted one as it partially conceals the contents of the cabinet. This would help you hide the mess in your cabinets for the time being and work on it when your time permits. This way, you won't be pressured to do additional chores right away.